They say that the best media consumption device is the one that's within arm's reach, and that's especially true of women who consume lifestyle video. As part of the POPSUGAR Insights/ulive 2014 lifestyle video study, we asked women to identify the decision drivers that help them choose which of their devices they will use to watch lifestyle videos. Convenience and accessibility are key factors that help women choose the device they will use to watch a lifestyle video. Women make their choices based upon which device is most accessible at the time (58%), which device allows them to watch wherever they want (52%), and which device allows them to multitask while watching (42%). Other decision drivers included if they were planning on sharing the screen or watching with others (36%), the device's screen size (40%), its battery life (31%), and overall video quality (30%). For younger millennial women between the ages of 18 and 24, the ability to be untethered and multitask is more important than for women overall. 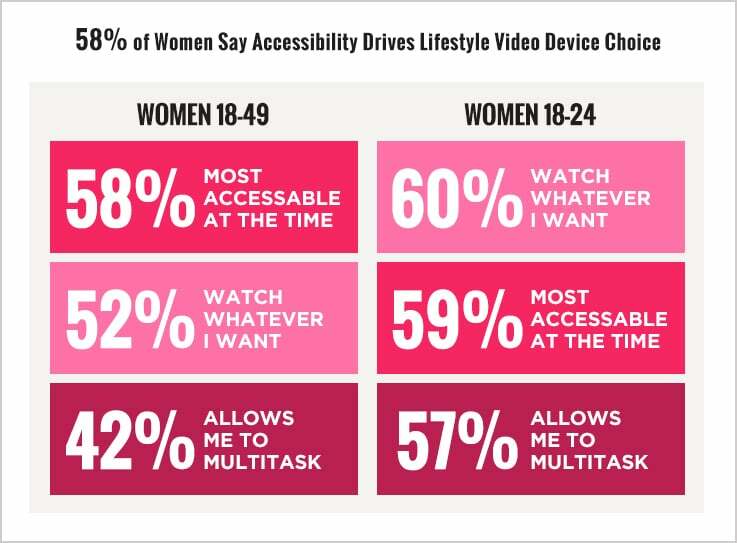 Sixty percent of women 18 to 24 said that the ability to watch whenever they want was a key decision driver, followed by accessibility (59%) and the ability to multitask (57%). Battery life (46%) and overall video quality (39%) were also more important to younger women than they were to women overall. For avid lifestyle video consumers (women who stream 240+ minutes of lifestyle video per month), accessibility was less of a concern (52%) than it was for women overall. Additionally, women who stream the most lifestyle content were more likely to say that the ability to watch wherever they wanted (57%) was important to them and were more likely to focus on video quality (42%) than women overall.